This week's "Who's Hot?" Artist of the week is Detroit’s very own TJ Upshaw! TJ is an R&B artist and songwriter who is bringing back the true sound and soul of R&B music. He recently dropped his new single “ONE 4 HER”, where his vocals capture the audience’s attention with a genuine feeling of passion and emotion. TJ developed his gifted talent for music growing up singing in multiple choirs and male quartet groups. He has recorded two mixtapes and just recently released his sophomore EP, "One 4 Her". This rising singer has had the opportunity to perform at many live venues between Detroit and LA at universities and clubs, opening for mainstream artists such as Wiz Khalifa, Big Sean, Eric Bellinger, Sammie, Dwele and J Drew Sheard and Day26. This an artist that you should definitely add to your playlist if you like real R&B, don’t sleep! We talked with TJ Upshaw in an exclusive interview, check it out below! QUESTION: How long have you been making music and how did you get started? TJ Upshaw: I’ve been making music since 05/06... I was in my senior year of high school and it all started by just doing hooks for rappers that went to school with me. QUESTION: musically, who has been your biggest influence in helping you along your journey and who are your favorite musicians? TJ Upshaw: I don’t know if I can say who had the biggest influence because I studied so many R&B greats. From Motown, 80ʼs & 90ʼs R&B, to a lot of artists from my generation. If I had to pick though, it’ll have to be Tank. Bro a hell of a artist, performer, singer and songwriter! At the end of the day that’s what I’m working towards. QUESTION: What artists would you like to collaborate with and why? TJ Upshaw: I would love to work with Chris Brown, Usher, Trey Songz, Sammie, Tank, Eric Bellinger... just to name a few dope R&B dudes! QUESTION: what do you feel is your best song/project ever released and why? TJ Upshaw: I think my best project is One 4 Her II - it’s all me. Its flavors to it. All kinds of vibes. It really shows my range as an artist and songwriter. QUESTION: What projects can we look forward to in the near future? 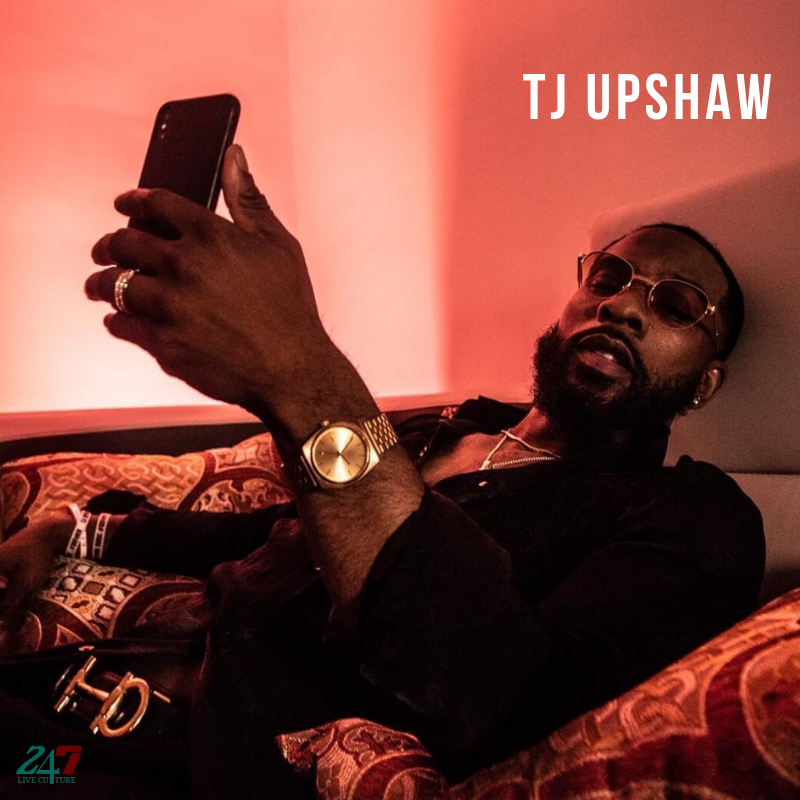 TJ Upshaw: I will Be releasing my first album 3rd quarter of 2019. QUESTION: How do you generate new ideas for your music? TJ Upshaw: Most of my music is just life situations. Lifeʼs feelings. I have ppl that come to me for advice at times... itʼs just so much that gives me inspiration musically. I really just try to make music that people can relate and vibe to. QUESTION: What motivates you and how do you define success? TJ Upshaw: Success in my eyes is defined as happiness. If youʼve reached that level of where youʼre completely happy, then congrats. Youʼve made it! My motivation is my family. Being their provider and seeing them smile is all the motivation I need to keep going. QUESTION: How do you describe your music to people and what separates you from other artists in your genre? TJ Upshaw: I call it #theVIBEofRnB - itʼs a feel. It creates a memory. Therefore whenever you hear it for the rest of your life itʼll create a vibe. Iʼm not too much worried about other artists in my genre. Iʼm in my own lane. QUESTION: Do you believe there is a formula to being a successful artist? TJ Upshaw: Naw no formula. What God has written is written. Just gotta put in yo work. QUESTION: Who is your greatest inspiration? TJ Upshaw: One of my inspirations is Big Sean. Coming from where Iʼm from and becoming one of the biggest artist in the world says a lot within itself. Not to mention all he gives back to the city. Thatʼs what itʼs about. Sharing your gift. QUESTION: In your opinion who is the most influential and successful artist in your genre today and why? TJ Upshaw: I would have to say Chris Brown. Heʼs the modern day MJ! Fasho Fasho! QUESTION: Which emotion more than any other, currently dominates your music? Joy, sadness, anger or passion etc. , and why? TJ Upshaw: Passion. I write and record with passion so thatʼs what you hear over the track. QUESTION: What sacrifices have you had to make, to make your dream a reality? TJ Upshaw: when dream-chasing you gotta isolate yourself from everybody, sometimes including yourself. Just to really map out how we goin make this thing pop. Once you figure that out you start to build your circle of individuals thatʼs on the same thing you on. So i sacrificed a lot of friendships to pursue this. We still good.. just not to the same extent as before. Iʼm on a mission! QUESTION: What aspect of the music making process excites you most? TJ Upshaw: I think the process of creating melodies & writing is lit. Thereʼs sooooo many different ways to say things and get your point across. QUESTION: Where do you see yourself and your music in 10 years? TJ Upshaw: in 10 years? A couple Grammys.. multi-platinum albums. Those are just a few goals. QUESTION: What advice would you give to other up and coming artists or people looking to break into the music industry? TJ Upshaw: In a world full of fugazziness, BE YOU! Every dream can become reality. You just gotta take the initiative to make it happen. This week's "Who's Hot?" Artist of the week is a singer from the DMV, Narde! We talked with Narde in an exclusive interview! Check it out here! This week's "Who's Hot?" Artist of the week is rising singer, CASHMA! We talked with Destiny Cashma in an exclusive interview! Check it out here!